Looking for beta readers for three different novels. 5-10 chapters each. Nothing overwhelming. Give me a bit of feedback. Blackfish and Cúliath, sister ships built by the great smiths in the land named after the Florentine navigator Vespucci. This land now called America, with cooperation with the natives that lived in the lands had met with Conn a number of times in the years after their arrival. The chief of the tribe at first told the homeless Irish to go home over the water. The Conn agreed, that was what they wanted to do, but so long as the hated red-coat wearing empire was in control, they would have to fight for their lives where ever they would live. One gathering, Conn traveled to the village of the tribal leader, bringing food and music with them. Food shared, to the beating of the Irish drums and a fiddler that excited the tribe into a clapping, laughing dance. Trade of one drum for another between musicians went for hours until their tongues were tired, their feet ached. And the fiddler played up all the songs and shanty’s he knew. In the end, promises were made, no papers, a gift of the bow of the fiddle was offered, but rejected. Only a tin whistle that they gave another flute in exchange was accepted in friendship. Even the old chief who never smiled, clapped his hands as the angels of both villages danced in grace and beauty that brought tears to the eyes of the parents of the children. The spinning dances, the wise woman blessed the Irish with the most sacred of prayers. Sleep that night in the warm evening came late, and the morning people rose late. Smiles and tired waves, the two groups, the permission for remaining in the land followed with promises to treat the land like their hearts. Drums beat on the walk back until the the sounds faded in the distance of the forest. Conn walked in silence, followed by the rest of the musicians and by his two sons, Keegan and Dana, along with the other lost children who came home. All the children walked together, in the months that followed their return, they did everything as one. Granuaile, the dancing strawberry blond girl of the night before, smiled with a look that Conn would have to write in his journal. This young lady who all the children said she did more magic with a cannon that any sailor couldn’t match, had eyes for their son. The chief of their neighbors promised Conn their support against the red coat if he would support them in their struggles during the cold of winter. In the long talk of the night, the chief’s eldest son would guide strangers to the land where and how to cut trees for the big ships and many big guns. That night, the prince of the chief lay down to sleep on the floor with a simple blanket. Keegan showed the chief’s son, Fighting Bears, a hammock saved from the Grampus. After some time with struggles, Fighting Bears got into the hammock with some embarrassed laughter. But fell asleep quickly. Later, he kept the net-like bed he slept in, then gave Keegan a knife made for scraping and one for hunting. Such was the state of the cooperative help with the people from across the water. Fighting Bears nodded, he told how the water ebbed and flowed. His ideas that the single ship was not enough. Under his prodding, Conn built two ships, prepared for combat with the skills of every artisan and metal worker that escaped the burned and poisoned villages in their home land. Conn had his own fleet, he would use the tools to make the world remember the crimes against his home. Under his prodding, Conn built two ships, prepared for combat with the skills of every artisian and metal worker that escaped the burned and poisoned villages in their home land. Conn had his own fleet. The two blacksmiths who also improved their skills on metal-working from the old country, hammered chains and formed links that they created out of the most crude of metals. Sounds of arguments between the big men, occasionally a comment about the clan of the other, but never did it come to blows. They were friends, cousins even, but their thought processes were different. This difference gave them an advantage in their forge and foundry. They learned to live as contemporaries of the shipwright Conn O’Danu, they took to his way of thinking outside of the normal traditions of their craft. In their hands, metals were as clay was to the sculptor. Bronze spikes, cast and forged, reheated and forged again. Many of the pieces ended up in a pile of ruined designs and sent back to the foundry for recasting. They built one ship at a time, it would be sailed by Conn and then torn apart. The evolving shapes became a predator with no equal, with speed and power, bred by complexity. The crew fought as much with the ship as they did with their victims. The ships built by the shipwright were always victorious in a lopsided battle, but the village knew could do better. By profanity and hammer blows. The latest rakish ship took shape. Local native tribes extracted promises from Conn would make the men in Red Coats pay for the broken promises. Keegan, returned from the sea with more than a hundred of the children that the families accused the English that Parliament took the children, promised the leaders of retribution during a great council meeting. The oldest and wisest of the leaders offered drink of a steaming cup out of a fire and then the men smoked a pipe that was as long as his Bradan’s grampa’s pipe, but more solidly built. When offered to Keegan after the council. The younger O’Danu choked and vomited outside of the circle of men, who all thought it was of great humor. All but the eldest, who other community people called “Indian”. The council explained did not like the term, thus the Irish Conn and his son Keegan strove to avoid using it. The day came, the father and son walked with the warrior prince of the tribe. The highly intelligent native sat on the new ship and spoke in Gaelic with Conn and his son. Directing them that to strike a blow against the redcoats would need a fist. The ship represented but one finger. “Build another. One for adults.” The Great Prince said. It was not a a suggestion. Conn stroked his chin. Before the evening was out, Keegan watched the elder version of himself speak with the tactical genius. The first truly new world ship began to take shape. In the hidden cove, where Irish, German and the original residents of the lands, built two ships, the Blackfish and Cúliath. Sister ships, one for the fathers, one for the children who refused to let the warm beds and fine meals deter them from the rage that they felt, a call to return and save those that were left behind because the Grampus was too small and out-matched by the navies of England, Spain, France. This knowledge did little to soothe the pain in the hearts of the children, grown too soon. Men and women of the communities up and down the bay supported the children as they came and went. Famous returning from an impossible life, the communities became igorant when the English or Spanish visited, looking for the Irish children who escaped slavery. No one knew or heard of such children except from the two warring Empires. The only united front the colonial powers shared, was the hunt for the hellions that sank so many ships of the empires. Captain Elliott, in service to his Parliament, and whose mission is to find the children and bring them to justice in the Courts. He left the bay once again in frustration, no one admitted to have seen such children. No news of the small ship, stolen from a merchantman had, seemingly, vanished. Captain James Elliott looked over the maps and gave a big sigh. Could it have been the children fell to the treachery of the Atlantic and perished? Had they become part of the vanished souls and ships that happened every year? Two hundred children, with skills that would make any navy envious, engaged, sank or stole ships of the Navy Royale were the most wanted pirates in the western Atlantic. And he was tasked with the job to capture the one that was whispered to be the son of the devil. A redheaded youth that was known as Captain Mac Díoltas, the demon of the sea. No one knew where he had come from. Some said that he was one of the spirits that the Deputatum Rex of Ireland was killed by a curse on a village. Others whispered that his name, which meant “Revenge” in the barbaric langauge of Hibernian isle. In command of the Black Eagle, he was positive he could capture the boy-pirate and bring him to justice at the end of the hangman’s rope from the yardarm of his ship, the Black Eagle. He was proud of his frigate-built warship, with it’s own list of victims from the Spanish, Dutch and French navies, few ships on the water worried Captain Elliot. But, Conn O’Danu had drive and focus unlike any other ship builder and Captain Elliot would soon learn the lessons that other seafaring warriors had discovered. The ships from the new world were not to be discounted in a fight. Diarmuid An Dubh and Nial Gabham stood side by side while they directed the teams to build what Conn asked. As a shipwright, Conn O’Danu never backed down from his strange ideas. He built ships that could turn in their own length, sail close to the wind with unheard of speed. He enjoyed the sounds of the hammers on the ships. They were hammers that the empire would hear from the America’s to London. This is really good, read this is something that you should. The young man sat on the overturned bucket with a quill in one hand, a book in his lap. He leaned in his favorite corner, eschewing the captain’s chair at the desk. The Blackfish was making way nicely, and his view of the ocean from the stern of the ship made his soul feel free with the expansive view when the storm doors were open. His long crimson hair, cut above his ears months before, now hung down past his ear lobes, dipped the tip of the quill in the jar of ink and put the blackened tip to the parchment. This is the first voyage of the Blackfish, and my father follows in the Fearg. A sister ship to this one. We have come here to this spot from a journey that started years ago. A summer day when my father went out with a ship that he had built. He was gone when the English came and destroyed my village. I saw my seanathair lay on the ground with a bolt from his manubalista jutting out of his chest and the soldiers that beat my mam into the dirt until she stopped moving. In those days, I thought she was dead. I woke up on a slave-cart, I still carry the scar, hidden by my hair, where the soldier hit me. When I came home, I found that my mam, taken by the English, was in the islands where Captain Christopher Myngs freed myself and my friends. I found when I returned to my father in the Virgina lands of a bay they called Irishtown. A backwater behind a Dutch settlement. I sit in command of this new ship, a crew of twenty and one hundred of the old crew. Only twelve adults serve on board. The older’s follow us, in the ship of my father’s design. We return in force, with my old friends Anna God-Wants and Jacquotte Delahaye to find my mother, somewhere on the islands of the Caribs. I will not rest until I find my mother’s fate and return her home, if I can. I cannot watch my father walk as a man alone any longer, he weeps at night for the life stolen from him, he believes I do not see. But he is my father, I hear him at night, I see his eyes. The strain shows on his face. This is not tolerable on a personal level. My friends all have parents, brothers and sisters all still missing and we will return to collect them. The Blackfish and the other ships can carry twice more than the crew who man them. Plus my plan will be to take ships on our return home. Empires will tremble at the thought of our rescue. No navy will prevail against us. We have new bronze cannon built by the one my father called Francois Buile. He showed us that the ranges of the nine-pounders are near double of our last guns. Granuaile has turned carriages of the guns into inventions of her own design. Adult men have learned to keep their distance from her. The ginger-haired youth rubbed his shoulder and laughed at his own humor. Looking out over the water, the old melancholy chased away the smile. Putting the quill into the bottle, he stood up and walked to the expensive glass window. An artisan, commissioned by the blacksmiths, made three cut-glass letters to remind a woman’s child of her name. “Fey” in small colored cut-glass gems sparkled in the sun, it burned in his soul to see it. Tracing his fingers over the inlay, the old anger rose again. He would get her back. They meant it as a gift to calm a soul, instead, it was a fan that increased the rage in his heart. Sitting again, he picked the quill out of the bottle and tapped the drop off against the mouth of the blown-glass bottle of ink and put it to the expensive vellum in his personal journal. I miss her, I can remember my mam’s eyes and her laugh. I was only nine-summers old when we were taken. I will find her and bring her back, if only for my athair. A son should never see a father broken. Slavery should never be a market and I will free anyone that is in service against their will that I find, so long as I draw a breath. Slave ships will be my prey, anyone who flies the flag of empire will strike colors on my approach. The Pirate Kingdom of the Sea will hold sway. Free people will embrace the name. Everywhere they use the label pirate as a pejorative, I will embrace it as freedom. Until my Mam is home, I will walk the decks and sail the seas until I am too old to chew my food. Many years ago, to me. The English declared war on our village. Today, I return to get her back. The Spanish, English and any who strike with the might of an empire, just because they can, I will make tremble with fear to sail these waters with their flags flying. My father and his crew accompany us in thinking they protect the children. We are the seeds of crimes that the Spanish, English, Dutch have sown. It us up to the children to protect the fathers. A member since the first tour on Grampus she had no fear of anyone, Beth Angelcries stepped through the door. Nodding, the captain of the Blackfish looked up into the hazel eyes of the girl who had shown such fury when they made their way home, causing Keegan to redefine the term in his mind. Looking down, he finished his entry. With the support of Anna Marie and Jacquotte we will stop at the harbor of Germantown and meet with those children who stayed behind and were adopted when we left their village last year for the Chesapeake. The adults in that town invited us to return when we wished. It is something I do wish to do, there is a debt of help I owe to the families there. Setting down his quill, the youngest captain in any fleet walked to talk with his personal hero. Their next port of call: Germantown. Dead crew, but for a handful that jumped overboard or put off on longboats. And in politics, those that administer care little for God’s Will or Random Chance. There was a ship lost, that was the question that the minister wanted answered from the only surviving officer of the Worcester. And “Will of God” was not an acceptable answer. Dressed in his military best, he entered into the chambers and walked where the squire led him. His Highness Gurdman Stonecutter, Governor For the Virginia Colony stood in the middle of the Great Room that served as his chambers. Tall, he was over six-feet and four inches tall and towered over everyone in the court and at ten-stone, he weighed less than most men. Archebald Whyte, late of the Worchester stood respectfully off to the side as told by the Governor’s secretary, until the Governor turned and addressed him. “Tell me a story, Quartermaster. What happened to the King’s ship I gave to Captain Willim?” The Governor said as he sat in a large chair, built just for him. The secretary poured a large cup of wine for the Governor, leaving Quartermaster Whyte standing, without refreshment. Captain Henry Willim knelt on what was left of the deck. “FIRE!” The words caught in his throat as he choked from the smoke of his burning ship. “NOT MY SHIP!” Captain Willim stood to the swivel deck gun and tried to fire the small cannon, looking about, he picked up a burning splinter of his ship and put it to the touch-hole of the one pounder. It was his last action in this world as he disintegrated into torn flesh and red mist when he was struck by chain-shot in that moment. The heavy iron ball and linked-chain tore through his body at nearly the speed of sound. The captain’s torso and left arm bounced along the deck stopping at the feet of the quartermaster, his life’s blood still spurting out of his lower torso from the beating heart that did not know it was dead, yet. The look on the captains face was one of surprise and it would stay with the quartermaster for the rest of his life. In a hysterical moment, the quartermaster saw the captain’s legs leaning against the shattered rail before collapsing onto the deck that would give him nightmares. The aggressor ship threw hooks for boarding the larger warship, Worchester. He knew it, the moment he saw the name on the stern of the opposing ship as it hove close. The name of the ship, whispered by the English navy sailors in quiet corners of pubs and with well deserved fear. Fear of children that were more adult than any man, who could handle an ax or cutlass better than any swordsman with a holy rage in their hearts and souls. Of a ship named after the swimming killer-king of the sea. Tongs and hammers, wood and copper, iron and wood, the ship took shape in the backwater of the great bay, hidden by the local geography, the ship grew in its lethal shape. Knife edged, a keel that reflected the inspired fin of the largest porpoise in the world’s oceans. The Blackfish grew in shape and lethal purpose. Conn O’Danu paced as he directed the Irish carpenters to follow the measurements and drawings to the bitter-end of each page. There would be no gaps, no errors. Conn used green, live oak for building the new ship, stout construction to the extreme. This pleased Conn, this oak was a resilient wood and made for the tightest construction ever envisioned. In the course of the construction, the men and women adults felt motivation to build a ship like never before, the motivation came from Keegan, who reassembled the crew of children that had returned home. Their mission, the small ones had decided, return to the islands in the south and rescue their friends, mothers, fathers and all their families that remained. The cruelty of the Empires of the world had taught them how to sail and fight. Copper and iron, Diarmuid the Dubh and Nial Gabham, the two talented blacksmiths of the village, who had made connections to other artisans of metals and the powers of Hephaestus, forged with imagination the plates of copper they attached to the hull of the ship, that remained hidden in the back-waters of the bay. Ideas from the boy who brought the children home, copper scales nailed on the bottom of the ship’s hull. Copper nails held the dinner-plate sized copper ellipses in place. Brass and bronze nails driven in measured distances by carpenters and craftsmen who followed what Keegan O’Danu and Dana, who the O’Danu’s had adopted as one of their own, showed where to drive the metal spikes into the wood. Under the shade of a tree nearby, children gathered by ones and twos as word spread. Mothers with fear building in their hearts, tried to pull these children who gathered in the clearing. Children, those that had been lost and then returned, and who still carried a fire in them that frightened most adults. Such anger, taught by the Empires of the sea and this New World that they colonized. For the treasures, a life was worth less than the sweat it took to pull a knife from a sheath. Father’s pulled on children who turned and stared at the patriarchs in the eye. Words of denial, spoken of in angered whispers. These were children who had learned a mission. Their first mission was to come home. A new call to arms, flames of deep anger sparkled in youthful eyes. Confidence, that only the young had, and a fury from the devil himself at those who raided their villages. And the growing Empire angered two groups of people so far. The Great Scots of the Highlands and the whole of the Hibernian isle. In time, despair would settle over the hearts of Governors and Ministers alike in future days as rumors of the hell-ship, Blackfish, that sailed the waters of the West Indies came to their ears. Higher they flew, the dragon giving slow, steady beats, the winds generated did not seem as severe as when they were first lifting off. Into the clouds they flew, even birds fell behind as the tail of the dragon slowly began to clear of the stowaway passengers that sat on the dragon’s tail. “Birds sit on dragons all the time?” Jona asked, finally having enough wits about him to ask. “Often they do, birds help clean in between the scales and folds of the wings. The dragon in turn keeps predators at bay. Few things hunt dragons.” his mother said softly. Aed turned and looked out the window, the shutter was held back with a gold hook. “There are things far darker and more dangerous than a dragon, even the most short-tempered and wild of dragons have things to fear, you will learn these things of the world at the school. You will do well.” Turning back, Aed was back to his smiling and proud self as they flew on in the wicker coach of the gathering light of the day. Jona looked at the clouds and down to the ground, they were already so far up that not even villages were visible and the edge of the world seemed curved. Jona chuckled, he had been in the cold back home, once even the lake nearby had frozen almost completely over. He knew what cold was, they had gone swimming in that icy lake that year. As soon as he finished that thought, he noticed his breath was coming out in fog puffs and his ears popped, looked as though his dad was smoking like the old man who lived down the road when he sat on his stump with a pipe. Jona pulled his hat down over his head, the ear flaps, lined with fur that was far warmer than he would have believed. As his ears warmed, he realized that he had a slight headache from the cold wind pressing in on his face. Jona looked around, both of his parents had buttoned up tight, with the collars turned up, all he could see of their faces were the eyes showing through slits in the leather and fur, their eyes glittering as they had more fun than Jona had thought possible in an over-sized wicker basket, that was hanging from the claws of a creature that until just last night he thought was only in stories. Something cold hit Jona right in the nose, then another, as they skirted along the edge of the high cloud, the sky was full of this white soft stuff. “Snow.” Aed laughed. “There will be more of it before we land.” His words were cut off by a clap of thunder that made Jona’s heart stop for a moment. The dragon snorted with a sonorous voice, that his dad nodded to and answered in the same snoring sound and closed the roof of the basket. The glittering tiger striped dragon banked to the left and got away from the thunder cloud, finding clear air as they moved into slightly warmer air and away from the storm line. “If she understands human talk, can she speak in human?” Jona asked his mother, moving close. For in the first time in years, Jona felt very small and needed to hold his ma’s hand. His mother pulled him close, putting her arms around her only child. “YES.” the voice was as deep as the clap of thunder, but understandable, even kindly sounding even if it was so loud as to make him jump while in Dearbhail’s arms. Jona had never been so cold as he was right now, even in the arms of his parents, bundled in layers of clothing- except for the over pants his mom had set in the corner, slowly his eyes closed, for the first time in years, he slept in his mom’s arms, no longer a man out of school of eighteen summers, but a child of his mother. His dreams were exciting and saturated with colorful dragons and adventure. Excited, even in his dreams. “This insulated armor is for harsh environments, you better be getting yours on, too. You will stick out like a wart if you don’t wear the proper garments.” chuckled Aed. Watching closely as his father picked up the over sized knife, his father looked him in the eye and then hit the side of his leg with the cruel cutting edge of the sword. Not so much as a dent in the material was left by the cutting edge. Smiling at his son at the strength of the armor that he had kept quiet for lo’ the many years that the son had come to join them. He helped Jona dress in his student armor. Jona dressed, the leather smelled newly tanned, the touch of it made him feel like a warrior of his own, slightly taller than his auburn haired mother, his jerkin fit him perfectly, as if it was known that he would be wearing it. “Come, son! Time to get going!” Dearbhail said. Her strong will reasserting itself once again. The family hiked out into a meadow outside of the village, past the Crannog used since as long as anyone could remember, should the wild men of the sea invade. In the middle of the field, dimly lit by the two torches carried by the adults, Jona had the dubious task of carrying the heavy gold griddle, stood a large wicker basket, enough to carry perhaps as many as ten people and all their food, bedding and still have room left over for any animals they might want to bring. The wicker was tightly woven, enclosed but for shuttered holes that served as windows to the outside. Aed opened the stout, side door and Jona could see the reclining seats inside. Just sitting there, Jona looked around for the cart or wagon that had brought it. Not quite understanding, he looked for a place to put down the bag that carried the heavy, gold cookware. “What is this?” Jona asked, learning not to make comments, because the truth of the last few days made his wildest imagination pale in comparison. Opening the top of the basket with a lever that telescoped the apex of the basket back to the sides so they could see out, his dad made a sound like he did when he was snoring, Aed seemed to make a whole sentence from the snorting and snoring sound. Jona began to laugh at his dad, when there was the sound wind coming from the sky, no clouds, but as Jona looked up, the something blotted out the stars. It… He could not believe it… It was the biggest flying thing that Jona had ever put his eyes on. Jona squealed like a cat with its tail stepped on and he fell over backwards when he craned his neck to look up, great orange eyes looked down on them from the sky and wings that went from edge to edge of his vision he had to turn his head to see all the wingspan of the huge dragon that hovered over them as it sat down on the grass as lightly at a bird. His face and eyes twitching as the lips of his mouth formed a big “O” without a sound when great orange eyes looked down on them from the sky and wings that went from edge to edge of his vision, he had to turn his head to see all the wingspan of the huge dragon that hovered over them as it sat down on the grass as lightly at a bird. His face and eyes twitching as the lips of his mouth formed a big “O” without a sound. After a few minutes, the only sound he heard was the rush of blood in his ears and a small funny sounding squeak like a squirrel made when caught in the claws of a hawk, only to come and realize that the squeak was coming from his own mouth, echoing laughter from far away was his own mother and father. Aed stood over his spasm-riddled son and looked down with laughter as his wife roared with laughter, all the first time students that had seen their first full-sized dragon had same reactions— normally they passed out or ran away in panic. “Jona, you did better than most kids! You at least stood your ground the first time you met the transport, even if you did a very good apoplexy dance before you fell, were you frozen or did you find it curious?” Aed laughed as he spoke to his son. “Wahh-wahh-wahh-wahh-wahh…” Jona repeated for several minutes, until finally he complained that the weight of the gold platter was holding him down. Jona suddenly realized he had a death grip on the bag that held the heavy gold platter to his shoulder, releasing it, he stood up with his eyes still fixed on the winged beast that sat quietly in front of him, A thought that struck Jona in his mind and he turned to his father with eyes as big as dinner plates. “Y-y-y-y-” his voice faded away and he cleared his throat. Jona looked around, the sun was breaking over the horizon, coloring the clouds crimson putting the dark, shimmering dragon that looked down at him with a bemused expression, its orange eyes still glowed in the early light. “You speak dragon! ?” Jona finally got out. Aed chuckled as his mother rocked back and forth on the edge of the giant wicker basket. “Of course we do. Yes! Both of us speak dragon, all two – hundred dialects. Your grandpa spoke more, but many dragons have disappeared out of the world.” Aed said. The great dragon overhead nodded slowly and sadly. Seemingly to understand human speech. “IT understands our language?” Jona choked out. His eyes looking at the shimmering creature. A small cap that seemed familiar, but could not recall just where, he pulled it on. It was the same kind as the hat both his mother and father wore, with the exception that theirs had feathers in it. His mother’s was a white feather, his father’s was shimmering green. “My own addition, we have had a few people fall out of the chairs over the years, this is my answer and seems to have been a good one.” his father answered. “How do they fall out? What are weeeeeeee……” Jona never finished his question as he instead screamed while the great drago took flight and latched its massive claws on the crossbar of the great wicker basket and took flight lifting them off the ground rapidly, going up into the sky. The elder Samhain’s laughed and their eyes shined with excitement as they gained altitude, the dragon lifted them up into the air and into the clouds. Their hair flying behind them as they held hands and enjoyed the ride. “If you are going to regurgitate your breakfast, son, please lean out the window. ” Aed said with a laugh. “I did not bring any change of under clothes for you, so you better keep control of your bodily functions!” Dearbhail yelled as she slapped her husband as she pointed down over the edge of the open window. Below the sun shown on the harbor, the black ship of the day before was still at dock– high tide was not due for several hours, the crew of the ship was seemingly gathered on the breakwater with many of the locals standing around them as they seemed to entertain the people in the early morning light. “W-what?” Jona asked as he peeked over the side at the group of men on the ground far below. “The sailors on the ship are also poets and artists. Often the sing at dockside a cappella at the end and beginning of the day. Sailors work hard during the day, morning and night in the slack tides they have time to show their stuff. Here, this morning they are singing on the docks. ‟Is he a Dragon Master?” Jona asked as he looked over the edge. His knuckles white as he gripped the wicker rail tightly. ‟On our side of the world?” Jona blinked. He had seen the red-headed captain several times as he had grown up. Never thinking that the ship that he was on was a pirate ship, or the crew who sang and brought smiles to merchants were all pirates. ‟What about his son, is… I think his name is odd. Dana I think. ‟Why are you called Dragon Master if you are teacher?” Jona asked as the big wings of the orange dragon as it took a now-rare flap of leathery wings. The blast of wind was shocking, but bearable. Quaint? Did he ever think of his mom and dad as quaint? Jona decided he had a lot to learn. This was nothing like school was over the last few years. Keegan and the boys of the crew laughed over a joke that Colm had made about the ship they had just stolen from the Navy Royale when the mistress of the guns, Granuaile walked up and punched Keegan on the shoulder as hard as she could. Those that knew the relationship laughed as the Captain groaned while he rubbed his shoulder. “That’s never going to heal, you know!” He complained while following her across the deck. “Granuile, wait. There is someone I want you to meet.” motioning to the newest of the crew to come close, Keegan introduced Dana to Granuaile asking her to get him fed. She took the skinny lad to the cook and had him eat his fill. Then returned to Keegan and complained that the boy stank of gunpowder, sweat, grease and general filth, which the Master of the Ship found in great humor. An unwashed body it seemed to give the Captain of the ship an idea. The unwashed body that offended Granuaile was one that she would scrub within an inch of his life. Granuaile never showed any affection to any boy, but she would stand next to Keegan as he led or called orders, often she competed for his attentions with the first officer, the small and intense Angelcries. Angelcries sighed as she watched the newest buccaneer eat from a distance. “This will be a challenge, but fun.” Colm laughed with a wink. After he had eaten, Dana protested with all his voice as the boys along with Granuaile and the boys and several girls stripped Dana down to his underwear, pinching their noses at the smell that was under the unwashed clothing was worse than he trailed behind him when he walked. Granuaile dragged the blond, smelly body towards a large tub, and the group scrubbed the child until he sparkled in the warm summer night air. Wearing new clothes that they gathered from chests of leather and silks they had collected, Dana Surya stood and smiled as he looked in a small hand-held mirror. Iollian made sleeping arrangements with the Captain and first officer Angelcries. Normally up to four children in a full-sized hammock. Dana shared the his with Iollan until he was comfortable. Angelcries often threatened the small blond for his snoring. In his first days often he coughed up black mud from his days in the holds of the English powder stores. Months passed and Dana Surya, the saved boy of the ships, showed new knots that he had learned from the English that could be tied more quickly and were stronger than the ones they learned with the pirates. Quietly one evening, after a month at sea, Keegan talked with Dana as they sat on the rails of the quarterdeck and the boy-captain explained his name from when the first pirate could not pronounce or spell his real name to the alias he now used as a family name. Dana looked down at his hands. Keegan paused and took a deep breath, nodding, understanding the part that the world took from the newest of the crew could never be replaced. But as someone other than a captain, he could do one thing. Dana hugged on his Captain and brother. Keegan told Dana of the stories of Bradan. After nights of such stories by all the crew that told of their lost friends, Dana knew that he was never again would be a lost boy. Dash the Captain who was also Keegan the Brother gave his word that he would never let that happen again. During the harvest feast, during the week of the Samhain, Fey was sitting with Conn at dinner with Beli, Donal, Niamh and Gael. After they settled down and spoke of family business, Gael and Niamh began to watch Fey, the elder women began to whisper among themselves that Fey appeared slightly different, a certain… Something. Fey wore a constant subtle smile for no clear reason, but the older women suspected the truth of it all. They also knew that the men were oblivious to the young wife’s movements and attitude. At the end of dinner, Fey looked at Conn in an odd way as if she had something on her mind to say and took his hand in hers. Before Conn asked his question of what she was talking about, thinking that he had done something wrong, Fey spoke softly. “You’re going to be a father.” His wife, best friend and lover said. Conn’s mother whooped that Fey was pregnant, not waiting for the young man to have the news sink in. Conn looked at the women folk like they had lost their minds, when Donal and Beli realized what the women were going on about as Donal tapped Beli on the shoulder and whispered a suggestion into the nodding Beli’s ear . Beli and Donal stood up as the women would do nothing but shush the men from talking. Then Beli leaned over to Conn.
“We have lost all control of this conversation, son. Time to abandon ship.” Beli said softly to Conn, taking care that younger man followed in the wake of the older men. After they had left the table with Donal, the men sat at a table under an oak tree by the road. Producing a bottle of a fine whiskey that made Conn’s tongue numb after the first drink. “We need to call a guild meeting and announce this to the men. Otherwise the women will be in charge.” Donal told Conn.
“Women are always in charge!” Beli said, laughed and poured more of the potent brew into his mouth. Conn only looked puzzled as his two elders laughed as if they spilled a secret. Conn wondered how his father could imbibe such strong drink. The whiskey burned his own throat and took his breath away and made his eyes water. Conn coughed and gasped, amusing his elders. The two patriarchs amazed Conn — again. As the elders always had throughout his life. How could they drink such vile stuff? Soon after, they had set up house and Conn announced to the village of a new addition to the O’Danu clan and, according to tradition, the women of the clan threw a party and the Matriarch of the Clan, Gael O’Danu oversaw the events. The party was a raucous affair and the house was host for two days of anyone who knew, thought they knew or knew someone who knew of the village. All were welcome while the women giggled and ate the food and delicacies that were laid out while the men of the clan cooked, drank beer, sipped uisce beatha, sang and danced. It was a party spoke of with fond memories in the years that followed. After Captain Morgan talked with Dash, they ate a full with grateful hearts in the room as the clock ticked the hours away, boys just finished their thirds of meat and roasted vegetables when Captain Morgan re-entered the room. “Nearly as good as Quilan cooks?” Morgan laughed as the boys nodded. “And it didn’t melt my tongue!” Bradan referred to some of the over-spiced meals he had eaten of late. The Captain kissed Mary with passion, slid his arms around her waist and pulled her into a tight hug. “Come young Master’s! We have someone we need to meet. Maybe two or three!” He bellowed as he strode to the door, followed by Dash and Bradan. Mary laughed at the three of them. They were a sight and she wondered if the world was ready for that team of rogues. The trio walked down the small street to the harbor where they entered a ramshackle construct that could be anything, save for the shingle of wood that someone painted with severed and bleeding appendage. “Henry!” The group inside called in unison, it was obvious, Henry was home. The boys looked at each other and grinned. “Sit, sit!” the man behind the counter looked as if he had been born before God made hair. His bald head shined without a single strand. But the tattoo’s on it and the great smile belied the glint in his eyes. He missed nothing in his range of vision. Morgan motioned to Dash and Bradan as they sat around a table that was suddenly cleared for the trio. Clearly this was “his” table. “I ha’ wee small beers for the young’un’s. The water is even brackish for drinking around here.” The barkeeper said in a basso-profundo voice. The barkeeper, gave an amused look for a moment, then said, “NO!” in a voice that felt like a small earthquake had rumbled through. Small beers in the area were a brewed without the effects of heavy alcoholic drinks. “The Firebrand, I know.” Morgan laughed with Gerris. Then he turned to the boys, Morgan told the story of who this woman was with twinkling eyes as he rememberd the events of the day. Gerris laughed at the old story that he had heard often before and it amused the barkeeper as he watched the young men react. Dash and Bradan listened in rapt attention. “Why doesn’t he return home? By the sound of him, he is from the Highlands.” Dash asked after a moment. “Indeed, He is a Scot from that area. He was a sailor on shore leave, at a pub where trouble happened and someone killed a man in a fight. Don’t know how it happened, but somehow he got the blame. He can’t leave for home, he left his family when he was but half his age now. No more than a boy, I’d reckon.” Henry answered. “Well,” He whispered to Dash and Bradan, “One of our guests have arrived. I had hoped to talk with Christopher Myngs before she showed up, but I have no luck there it seems.” Henry chuckled and stood up to meet the new guests. If the first woman came through the door was blond and beautiful for her age, she was old, almost elderly — At least nineteen or twenty. Almost twice Dash or Bradan’s ages. The two boys froze in their seats as the intense blue eyes locked on Captain Morgan and she made a beeline right to him. The next woman through the door was unlike they had seen before. Dark red curly hair, steely blue eyes and skin the color of dark-honey. “Oh Henry! You have held out on us, trading in beautiful men now it seems?” Said Anne, who sat next to Dash and ran her fingers over his head, “This one is beautiful, and this dark-ginger hair!” She was looked the boys over like they was a tasty morsel of food. Dash and Bradan were felt the fear of prey that was the next meal that this woman was about to have. Dash paused when the two women had looked at each other with wide eyes and started to laugh. Jacquotte smiled wide as she ran her fingers through Bradan’s hair. “Ooh, young man, I would keep you safe in my home forever.” Then the smile turned to Dash and she looked into his emerald-green eyes. “Baby-boy, you serve someone somewhere. Where do you call home?” Jacquotte asked. “Henry, I want this boy and his friend. They are needing a woman’s touch, I swear!” Anne injected. “Ladies! Ladies, keep your hands off. These boys are just here for a visit and as they have said, they are free to do as they wish. E’en a couple of beauties as y’selves must respect the fact they only just now approach manhood.” Henry admonished the two women. Bradan stared at Jacquotte, his eyes frozen on her eyes and his ears bright red from the attentions of the woman buccaneer who men would kill to have such attention paid to them. Even Henry had stopped to listen, never had he heard this woman’s story. “What do they call you?” Bradan asked. Bradan boggled at the dangerous way she said it. Softly, but with the rage of a Sidhe that his father would tell him about. A raging spirit that might lull you in with soft sounds and destroy you in a moment. 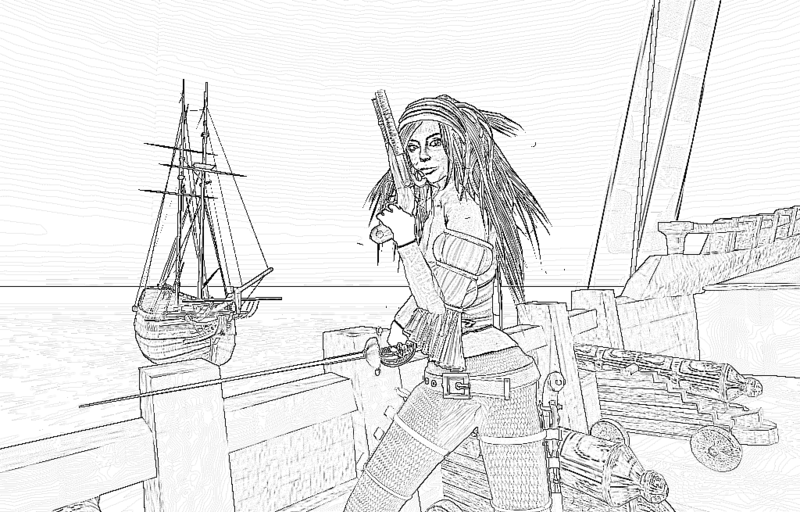 Jacquotte was a pirate that the Spanish feared more than they had fear of an entire navy of men and cannon. “I’m in love.” Bradan whispered to Dash that made Dash laugh into his tankard of small beer and he choked as suds covered his face. “You made my beer come out my nose!” Dash complained. Which made Bradan laugh even harder. Henry looked around, several men were walked towards the pub from down the road. He could see out to the end of the street from his vantage point — it was the reason he liked this table so well. He watched the men with a sharp eye, he recognized one of the older men, a fellow Captain that he had sent a message to some time before. It looked good if Abraham Blauvelt had responded. Henry and Abraham had served together under the command of Myngs when they had managed a hugely successful raid along the Spanish Main.